Last month, I received lot of comments and e-mails from my blog readers requesting me to post some free FUD Crypters, So today i have decided to share Chrome Crypter Which is currently FUD - Fully undetectable by antivirus. Crypter is a software used to hide our viruses, keyloggers or tools from anti viruses so that they are not detected by anti viruses. Thus, a crypter is a program that allow users to crypt the source code of their program to Bypass antivirus detection. 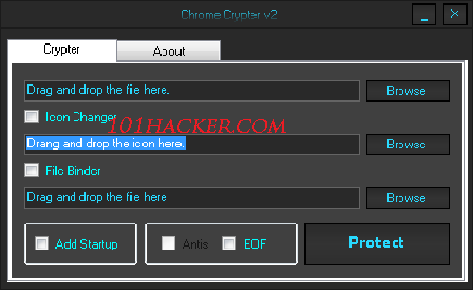 If you are new to crypters then i kindly suggest you to read my previous post "Crypter Software To Bypass Antivirus Detection"
i HAVE ALREADY USED CHROME CRYPTER but that was not FUD but this is 100 % FUD , have u edited it ? i mean did u recoded ? Its great, however am tryin to create my own crypter.. I actually came in looking for Best Accountant WordPress Template and don't know why google brought me here ..i say i was lucky enough to have to have this crypter. Simple superb tool. I will also share this on my Facebook blog. how do i decrypt it? i have a problem. i crypted a rinlogger file and i'm having some problem killing it. what should i do? Hi mate i have tried to download but sadly i am receiving a problem it says Application failed to intialize please mate tell me what should i do i already closed my anti virus i have followed every step of your's but it's not working please help me mate. It got detected by McAfee almost immediately unfortunately. I just hope that it'd be undetected for a while from free av's. Most people have free ones.